27 Sep It’s Fair Week! The last weekend of September is upon us, and in our neck of the woods it is known as “Fair Week”. I love the fact that the entire town of Durham pitches in to put on this four day event. The schools are even closed on Friday so the students can go to the fair! We are bringing our Monarch Butterfly Exhibit to the fair and will be in the Discovery Center. So far we have released 815 monarch butterflies and have 53 caterpillars and 117 chrysalises waiting in the wings. Everyone will be able to see the caterpillars transform to a chrysalis and, when the butterflies are born, tag them for Monarch Watch and release them to the butterfly garden that we helped to plant outside the Discovery Center tent. On Saturday at 11 am I will be giving a talk in the Discovery Tent on Planting for Late Season Pollinators and Migrating Butterflies. All talks are free with your admission ticket to the fair. 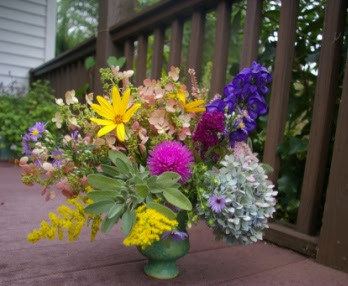 With the shortening days, I find myself filling my house with vases of fresh cut flowers from my garden to cheer me up. What do you have growing in YOUR garden to fill a vase? Above I chose asters, goldenrod, monkshood, hydrangeas, perennial sunflowers, Celosia, globe amaranth and sage leaves. weed seeds germinating in October. 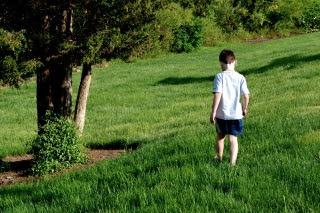 We are completely stocked with our custom lawn seed blend, Eco-Lawn seed, compost, shredded straw, and organic fertilizers to make your lawn healthy and beautiful. Do this in early October and you will be so proud of yourself next spring. All this rain also makes it super easy to apply beneficial nematodes to your lawn to control all sorts of grubs. They swim in the soil water and we usually tell you to water the lawn first. No need this week! Tune in this Thursday at 5 pm for Designing with Bulbs on Facebook Live. Miniature Iris reticulata and Pushkinia are late March/early April bloomers. We will talk all about succession of bloom with bulbs. 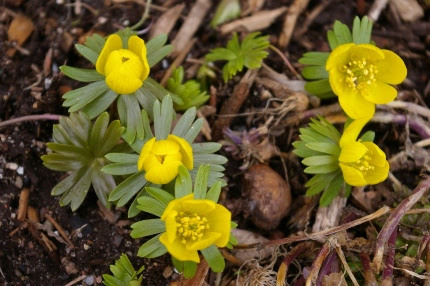 Winter aconite bulbs start flowering in late February, just when you need them the most. Plant the earliest bulbs to feed your soul and to feed the native pollinators. color from late winter thru July. I will also explain where to plant the bulbs and why. It is my very strong opinion that a garden is simply not complete without bulbs, especially the earliest spring bloomers. We need color so badly in March and April. Anything that blooms in February is an absolute miracle. The native pollinators agree with me- they are starving for nectar and early spring bulbs provide it. Speaking of design, our October 20th Solving Garden Design Dilemmas is really filling up. It’s only three weeks away! Click here to read all about it on our events page and download the brochure and register on-line. There will be three intensive workshops by three garden design experts- Karen Bussolini, Christine Froehlich, and yours truly. We have preparing for this for almost a year. It is the ideal way to finish out the growing season with your garden fresh in your mind and work on a plan of action for renovating and fixing any problems you may have. There will be plenty of time for questions. We just got in a new shipment of bagged mulch, our two favorites, Fragrant Forest and Cedar. This is just in time for the fall garden renovation season. As we begin digging, dividing, and moving our plants around and planting new plants, a thick layer of shredded bark mulch is important. Why? The soil is warm and mulch keeps it warm a lot longer, thus allowing the plants to root in for weeks and weeks. Also, as you dig and turn up the soil, you expose weed seeds. Mulch will prevent them from germinating. My orange winterberries are really coloring up this week. 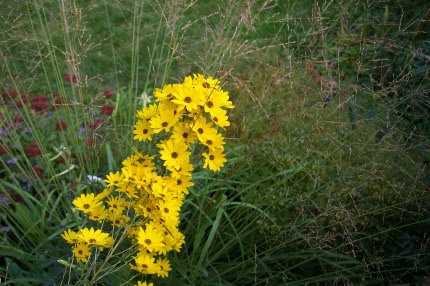 We have some plants arriving this week to supplement our fall offerings. 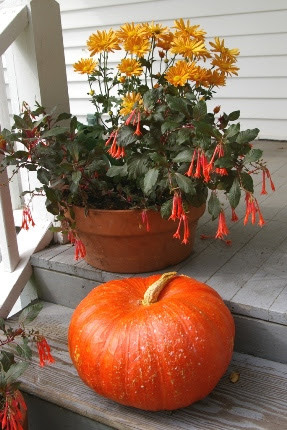 Get rid of your tired summer plants and add a perennial mum ( I chose ‘Bolero) and some pumpkins to your front porch. It’s Fair Week! Let the Fallscaping begin! and ornamental cabbages, we sell all kinds of late blooming perennials, winter pansies, fall bulbs like saffron crocus, and a nice selection of ornamental grasses that we love to use in our garden projects. We also get in fresh fall annuals as most people want to freshen up their container plantings and gardens during this fabulous fall outdoor entertaining season. Fallscaping is what we call it! It incorporates pumpkins (white AND orange and all kinds of funky types as well) and ornamental gourds. People are also thrilled to find we are still well stocked with fall organic veggie crops and they just keep looking better and better. On Monday I finally harvested the rest of my tomatoes and made sauce and chili. I pulled the vines, cleaned up the beds, and decided to plant more lettuce and TONS of radishes as the moon phase is perfect this week. We just got in the 2019 Gardening with the Moon Calendar. If you are thinking of learning about this ancient practice or you want to give one of these calendars as a gift, we’ve got them! 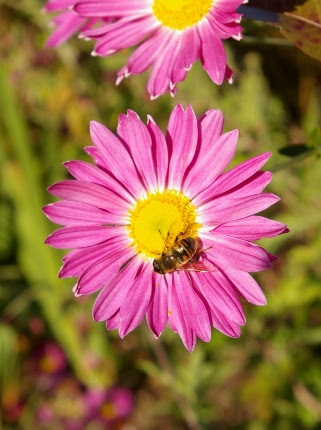 Aster ‘Alma Potchke’ is so easy to grow and the bees adore it. 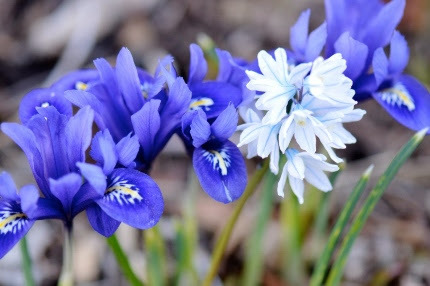 live through the winter, and return in the spring, combining beautifully with bulbs. We fill the bed on the south side of our shop with winter pansies, and they weave in among the winter aconite bulbs that have naturalized there. When they both start to flower in late February we celebrate! Asters are one of the most important plant genus for migrating monarchs and native pollinators. We have SO many different kinds, with two big shipments arriving this week to restock. Asters can be ground covers or 6′ tall and everything in between. My yard is overflowing with them. And there are so many to come… October brings all new asters popping into bloom such as the aromatic aster (Aster oblongifolius ‘October Skies’) and the calico aster (Aster ‘Lady in Black’). 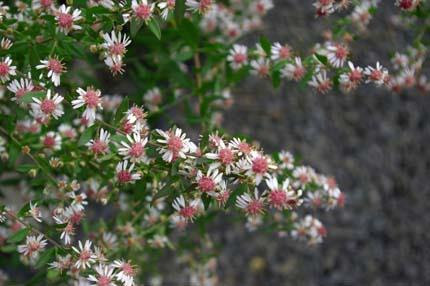 The woods are also filled with native asters and we sell many of them for naturalizing in those challenging areas. The delicate blossoms of Aster ‘Lady in Black’ deserve a close look. They contrast so well with the burgundy foliage. 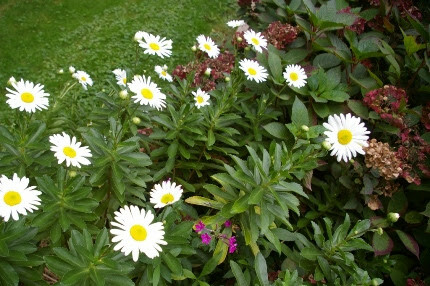 This aster blooms in sun or partial shade. 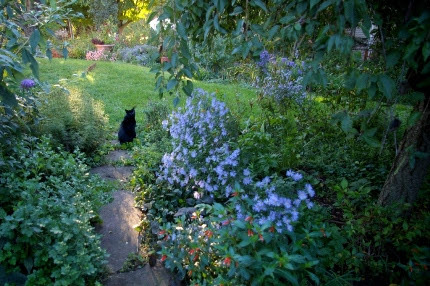 My beloved Bella, who passed last year, loved to hang out with me in my garden. Here you can see my yard filled with the soft colors of blue asters and perennial mums in early October. 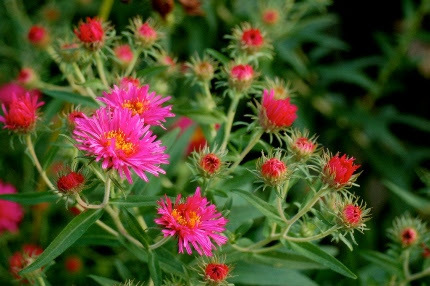 Since aster are simply so vital to the fall garden, we are putting them on sale for the next two weeks along with our exciting collection of Echinaceas (coneflowers). We have also moved our Clearance Sale area to an entire bench in the nursery yard as we continue to add past-bloom or less-than-perfect plants to this deep discount zone. Wow! Amsonia hubrichtii puts on quite the autumn display of color in the landscape. Another mainstay of the autumn season are perennial mums. We specialize in them, as I have been studying and collecting them for decades. Read the article below to understand the difference between these and the annual “grocery store” mums. Many of the best perennial mums are considered autumn daisies. They have long stems for cutting and withstand light frosts with ease. Autumn also means colorful foliage. We all look forward to the leaves changing on our trees, but don’t overlook the colors of flowering shrubs and perennial leaves to add excitement to your yard right now. The blueberries and Iteas will turn brilliant red. Fothergillas and most Viburnums put on a vibrant display. 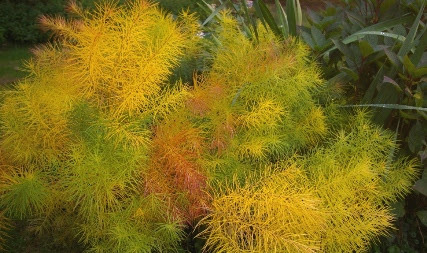 My favorite perennial for fall color is Amsonia hubrichtti. Blue star has soft blue flowers in June. But the real show is in October, when the feathery foliage turns bright yellow and orange. 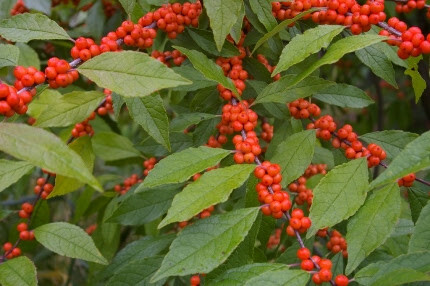 I use this plant in so many places in my designs to anchor the garden with good foliage structure. Heucheras and Heucherellas are also vital to color up the garden with perennial leaves. As the nights cool down, our thoughts start turning to bringing our houseplants inside and re potting them. We just added a houseplant seminar for Saturday, October 6th to our Calendar of Events. I have loved houseplants since my college days and want to share my knowledge with all of you. I am SO happy that houseplants are now back in fashion. We need them desperately in the winter months. ‘Autumn Joy’ in my garden. I hope you can plan on a visit to Natureworks this week. We are now open 7 days a week again, including Sundays from 10-4. We have everything you need, and a lot you won’t be able to resist taking home with you to make your fall beautiful and colorful. So we will see you soon, here at the shop or at the Durham Fair this weekend.